This is by far the best Rhodes emulation I have played. It just feels and sounds right. I can't leave it alone. This is what a Rhodes is supposed to sound like!!! I was always disappointed with the stock sounds of the Motif series especially the over-processing that is done to mask a crummy set of samples. Not any more! This collection is awesome and the custom hammer work really shines in the context of a mix. I have been working on and listening to that Rhodes since the eighties. 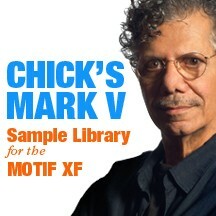 I close my eyes and listen to that sample in any of it's forms and I am on stage again with Chick again. That is his modern and favorite Rhodes sound.